Originally posted in the Philadelphia Style Magazine on August 21, 2013. A trio of Philadelphia tastemakers offer a rare glimpse into their luxurious residences to share their flair for all that is sophisticated and exquisite. Interior designer Bennett Weinstock’s fascination with old-world architecture and English antiques is on full display inside his Rittenhouse Square home. A Center City home’s black and white color scheme is anything but boring in the hands of stylist and retailer Brooke Dillon. Elyse Barroway’s sprawling Main Line residence blends antique finds and a few elements of surprise. Originally posted in the Philadelphia Style Magazine on July 10, 2013. Alexander Greenwood and his business partner, Elric Endersby, of The New Jersey Barn Company(908-702-8896) are preservationists at heart. Their daily routine is turning one person’s debris into another’s storied abode. Acting on weekly calls from developers, farmers, and historical groups, they swoop in to save old barns from the wrecking ball, then disassemble and catalogue them, hoping to someday find each one a new owner and a second life as a guesthouse, a garage for antique cars, a party barn, or—in the case of one Bryn Mawr couple—a luxury antique pool house. “We’re like an adoption agency,” says Greenwood. “We try and match a barn we have to an owner and their needs.” The pair have been rescuing structures in the area since the late ’70s and have placed them in sites like Bucks County, the Main Line, and eastern Long Island for clients as high brow as Steven Spielberg, Larry David, and Bill Murray. For the Bryn Mawr project, a modest-size post-and-beam structure called the Atchely Wagon House, dating to 1847 and found on a farm outside Hopewell, New Jersey, was the perfect fit for the property. As with many of its projects, the company provided design services for the interior, working with architect Christopher Pickell of Flemington, New Jersey, a frequent collaborator, and general contractor Jim Littleton of Flourtown on a design focused on entertaining. The new wagon house’s frame is done in rich, authentic white oak, and the building features an open living and dining room, with a rustic stone fireplace as the centerpiece. The oversize doors to the dining area open onto a terrace of recycled pine and the pool beyond. Because space was limited in the kitchen, it was carefully planned for efficiency. 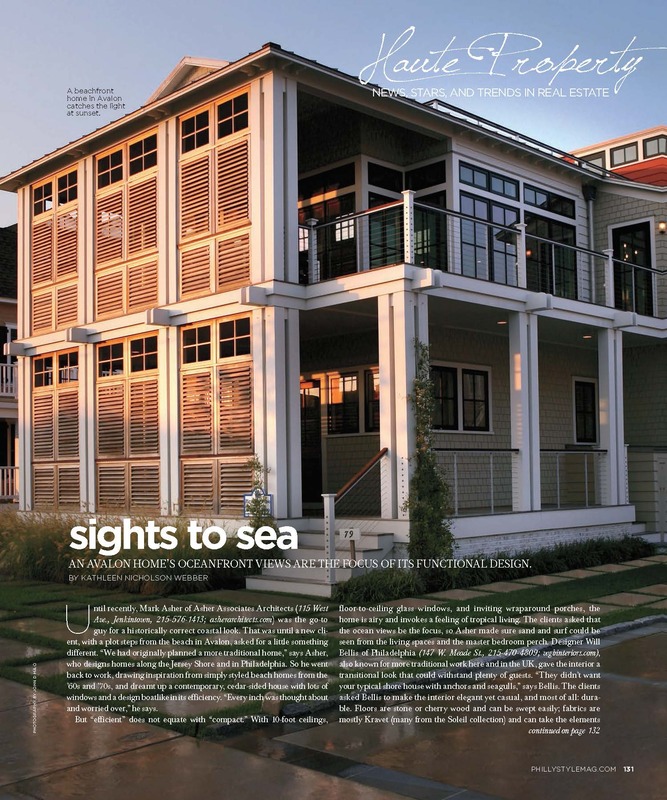 With rich wood countertops and painted wood cabinets, it feels as if it could be a boat’s galley. Upstairs, a second fireplace warms guests who are using the changing room or bathroom after a swim. From this perch, visitors can also get a closer look at the garden, thanks to large doors that the homeowners like to keep open for fresh air. Landscape architect Charles Hess, of Hess Landscape Architects (1570A Sumneytown Pike, Lansdale, 215-855-5530), also had a hand in this extensive project. He was charged with siting the barn in front of the pool and with views of the spa, garden rooms, and seating areas. Hess, who has worked on projects as varied as Horace Trumbauer properties on the Main Line and lush estates in the Bahamas, gave a nod to the turn-of-the-century Pennsylvania-style main house in his design for the new “antique” pool house. It took him almost eight months to plan and another eight to complete the project. He pulled away overgrown gardens near the pool and created shaded living areas around the water. Hess and his team built a covered porch, an arbor, a seating area in front of the barn, walkways, and an elevated spa whose hot water overflows into a trough and then recirculates in the pool. To transition from the main house’s library to the outdoors, the elegant arbor is draped in wisteria. He fashioned garden rooms framed by boxwoods and filled with roses, hydrangeas, spring flowers, tree lilacs, and yellowwood trees. 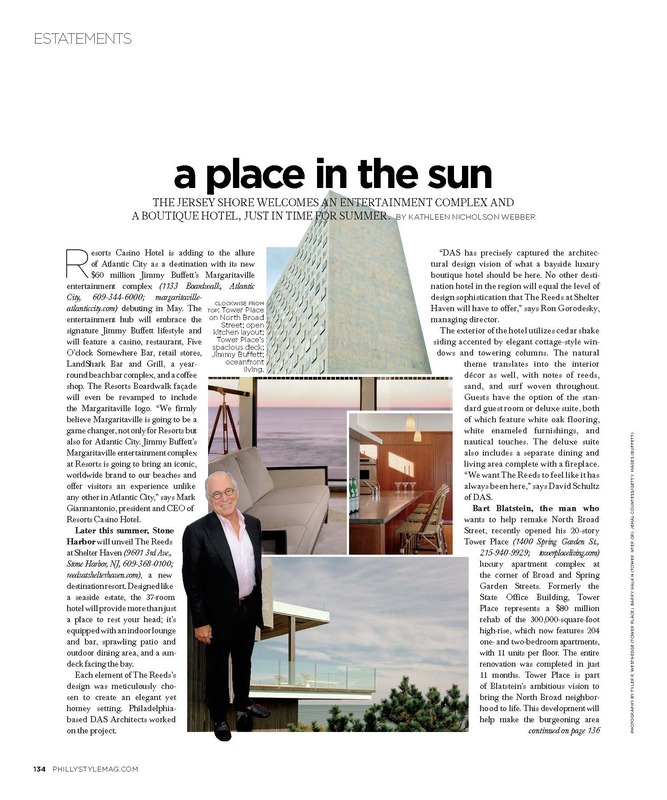 Originally posted in the Philadelphia Style Magazine Late Spring 2013 Issue. Originally posted in the Philadelphia Style Magazine on April 8, 2013. Buying a home designed by a star architect with the thought of revamping it can be a daunting proposition, especially when the work is by the legendary Pritzker Architecture Prize–winning I.M. Pei, best known for designing the Louvre Pyramid, the John F. Kennedy Presidential Library and Museum in Boston, and the Miho Museum in Japan. Deciding to take one of his creations down to the studs and redesign it to fit a modern family of three requires another level of bravado. This kind of daring was precipitated by the arrival of a baby and a daily trek of 52 stairs to the door of a third-floor condo owned by Kevin Yoder. Yoder, an architect who had worked in high-end hospitality design for BLT Architects and corporate interiors at EwingCole, and opened his own firm in 2010, was living on Third Street at Locust with his partner, Harvey Hurdle, when they were months into parenthood; they knew they needed a family-friendly home. They both loved all of the green spaces in their neighborhood, so the search was limited to Society Hill. Across the street was a block of I.M. Pei townhomes, built in 1962 during the area’s redevelopment. “In the late ’50s, the area was rundown, with lots of commercial properties and abandoned homes,” says Yoder. The city’s plan was for it to once again become a model residential area.” Led by Edmund Bacon, the City Planning Commission’s director, the city bought 31 acres near Dock Street for a new apartment complex that would become Society Hill Towers and 37 brick-façade townhomes. Chosen for the design over four competitors was the New York firm Webb & Knapp and its noted architect I.M. Pei. Yoder, whose hospitality work includes Revel resort in Atlantic City and Echelon Place in Las Vegas, bought one of the townhomes and took a year to modernize the 3,200-square-foot space. Originally the idea was to update the kitchen and baths, which had not been touched since the ’60s. Once he started, though, he wanted to do more, installing recessed lighting and new floors, keeping the bones of the house and the signature Pei features—such as the spiral staircase that acts like the home’s spine, starting from the lower level and extending to the third level—intact. In his plans, he decided to reconfigure rooms, take down walls, and use the same palette of materials throughout the home to make it appear more spacious. The end result is an ultramodern house warmed by his use of medium-hued woods, as well as color and texture throughout. Yoder, who now works on redesign projects with other Pei homeowners, feels like he honored the prize-winning architect’s work with the final product. “Pei’s designs are pure geometry. Everything is curvilinear and pure forms. The rooms of this new design now reinforce those lines.” 241 S. 3rd St., 267-994-1103. Originally posted in the Philadelphia Style Magazine on January 23, 2013. 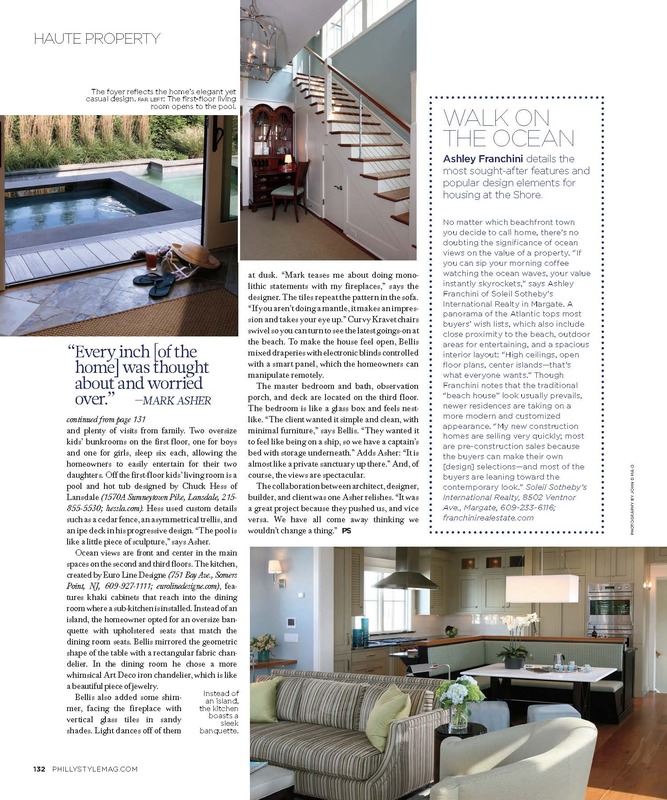 When Ani and Mark Semerjian look back on the two years it took to design and build their Main Line dream home, it reminds them a bit of a prize fight—one between two creative types with different opinions. Sometimes she’d win a round; sometimes he would. In the end, the couple—Ani, an interior designer with a flourishing business, and Mark, a high-end custom builder and renovator—created a luxe, spacious Tudor with nods to the modern (for her) and European (for him). The mashup is a manse with an old-world charm that makes the home look like it’s been in Devon for hundreds of years. When she wanted dark floors and he wanted light, she won. When he wanted thick moldings, they ended up in all the living spaces. Mark started with the exterior, a Norman-style stone Tudor with a flare roof that looks European. They then fused the outside of the house with the inside. Their opposing styles now coexist: They used traditional materials like Italian marble and Jerusalem limestone in an updated way. Mark’s mission in this house was to have lots of wows wherever one went. “People should say, ‘Oh my God, look at that.’ That’s what makes a great house. We spent a lot of time creating those wow factors,” he says, noting elements like lighting and architectural details. They chose each room’s ceilings, an oft-forgotten area, to create some of these moments. “I think it is important to have something for your eye to look at in a room when it comes to a ceiling,” says Ani, owner of the design business Semerjian Interiors, now 10 years running, who appears regularly on NBC as a design expert. Mark designed a central gallery running through the first floor with a bow ceiling, flanked on either side by intersecting arches. The two-story, 25-foot foyer was modeled after a cathedral in France. “When you enter the house and look up, you see arches and intersections,” says Mark, who has traveled to Europe extensively for inspiration and incorporates truly old-world building techniques into all of his homes. The foyer also features a dramatic wrought-iron staircase and limestone floors. The living room’s ceiling got special treatment. Made of real plaster with a diamond pattern, it is almost Gothic-looking. In the breakfast area, one looks up to find antique oak beams and corbels. Mark readily compliments Ani’s ability to soften the Tudor home, which could have come off as too masculine. In the nearby kitchen, the designer chose one object, as she did with all the rooms, to become the piece that the room is designed around. In the kitchen, it was oversize lanterns. 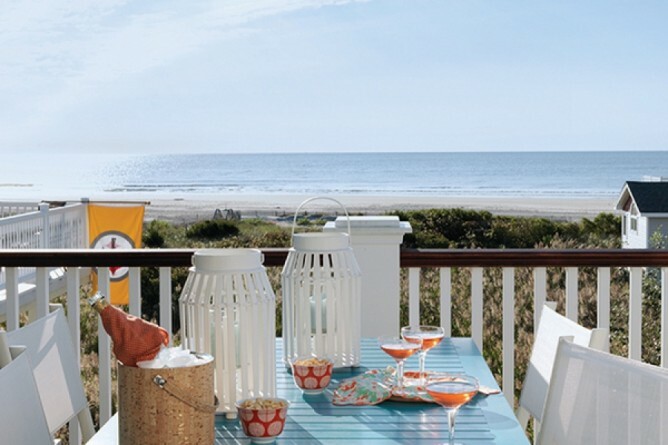 Gas lanterns, that is—the same kind as the ones the couple used outdoors. Ani called the township and got permission, and they had them installed. “They bring the outdoors in,” says Ani. In the dining room, the focal piece was the Persian rug her grandparents gave the couple. The colors of the rug set the tone for the wall color—a deep, grayish navy that gives the space an English tone. For the master bath, the room was built around a tub that the couple designed, which was cut from an eight-ton chunk of stone and hand-shaped by stone carvers in Italy. Originally posted in the Philadelphia Style Magazine on September 17, 2012. 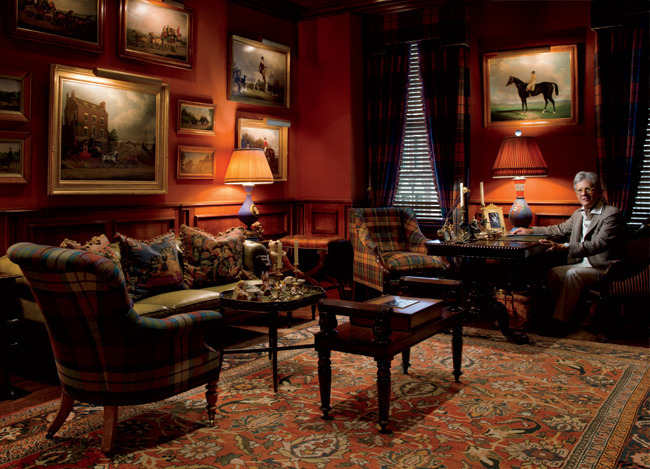 Designer Bruce Norman Long has always maintained that the things that touch our lives most are the clothes we wear and the rooms we live in. The self-proclaimed clotheshorse prefers classics in his closet (a navy Gucci suit, Ferragamo shoes, and London-made French-cuff shirts, khakis, and jeans), as well as in his home. For his most ambitious renovation, he converted an old schoolhouse in Carversville, in Bucks County, with partner Mark Todaro, a commercial designer in Philadelphia, decorating it with leather Barcelona chairs, bold upholstered antiques from different eras, and a trove of art amassed over the years. The brightly colored pieces play off the art. “Every painting is based on primary colors—yellow, red, and blue—and my fabrics are those colors.” For simplicity’s sake, the walls are all white, “otherwise it would be too much going on. Besides, stone has a strong personality.” On the walls, Long hung an impressive collection of regional art, from Impressionists to Modernists. 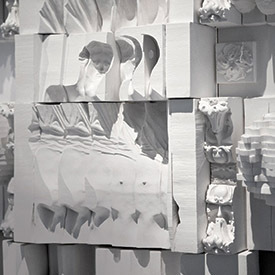 After studying architecture at Rhode Island School of Design, Long worked for designer Mark Hampton on everything from a private office in the White House for the elder President Bush to the biggest and most expensive house in Palm Beach. 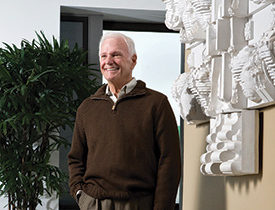 After five years at the firm, he went looking for a new challenge; following a brief stint in home furnishings retail, he opened his own design firm in 1993, focusing on homes in New York and Princeton. His client list now spans from London to Loveladies, from the Main Line to Switzerland. Originally posted in the Philadelphia Style Magazine on March 7, 2012. Dan Neducsin had no intention of moving from the sprawling 19th-century threestory brownstone on Delancey Street that he shared with his wife, Luana, when he read about a new high-rise to be built in Center City. 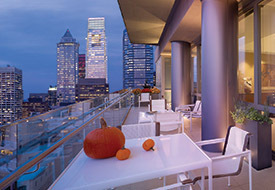 The project, however, hit the trifecta of developments: a contemporary-style building at 1706 Rittenhouse Square, one residence per floor; luxury amenities such as an automated parking garage that brings your car to you, a gym, and a pool—oh, and panoramic views of the city from each home. Neducsin’s interest was piqued. You see, as the man who is responsible for bringing Manayunk from hilly, dormant neighborhood to bustling destination town, he is a guy who loves views. His house in Avalon has them, and he thought if he could replicate that feeling in the city, then he would most certainly move. “I read about 1706 Rittenhouse’s big outdoor spaces. A lot of what I loved about Avalon was here,” says Neducsin. 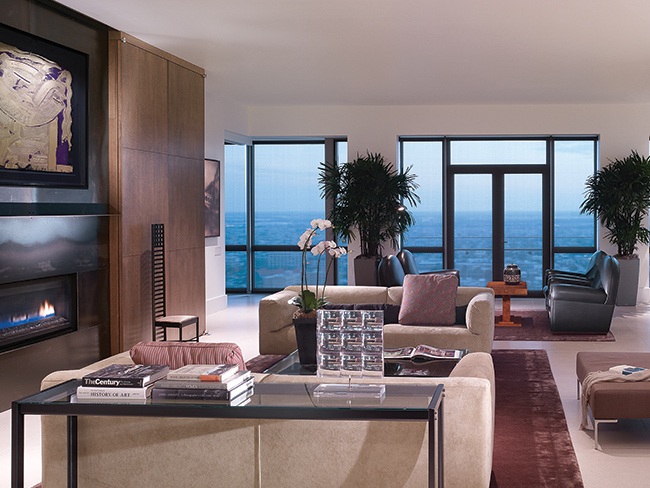 Each residence has panoramic views of the city. A Peter Gallo relief sculpture commissioned by the Neducsins separates the living and dining rooms. 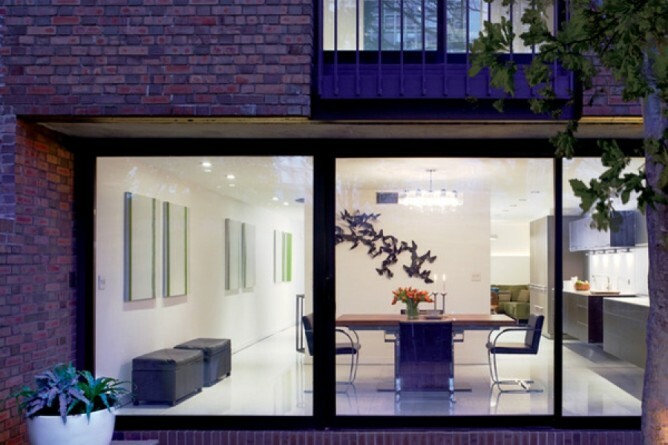 The dining room maintains the home’s light, modern tonality. And so they made a deposit before a shovel even entered in the ground. Neducsin quickly called Gabrielle Canno of Canno Design to start working on a floor plan and design. She had worked on his other homes, both with a modern bent; the Neducsins’ house on Delancey was a mix of old (architecture) and new (furnishings). “Everything we did there was modern. He wanted even more modern here,” says Canno, who worked on the project in conjunction with David Amburn and Jerry Jarosinski of architecture and interior design firm Amburn/ Jarosinski. Each resident bought a box and had it fit out, she explains. Building standards were high, so they kept many things. She laid out the two-bedroom, 4,300-square-foot space before the residence was built, making an open plan that would take advantage of the 360-degree views of the city and rivers. Almost every room has two entrances and not many doors; any ones they do have are hidden. “Because there are so few walls in the apartment, it really was a lesson in paring down,” says Canno. Most of the furniture and art from the Delancey brownstone made the trip to the new home. To unify the open rooms, Canno used large, palebeige porcelain tiles on the floors throughout the house. “Light transfers from room to room in this space. It is pretty spectacular,” she says. Special draperies and solar shades were installed to keep the furniture and art from fading, but walls are white with golden colored accent walls to make the space feel crisp. Canno designed built-ins for the library, living room, and master bedroom, made by woodworking craftsman Michael Lutz. 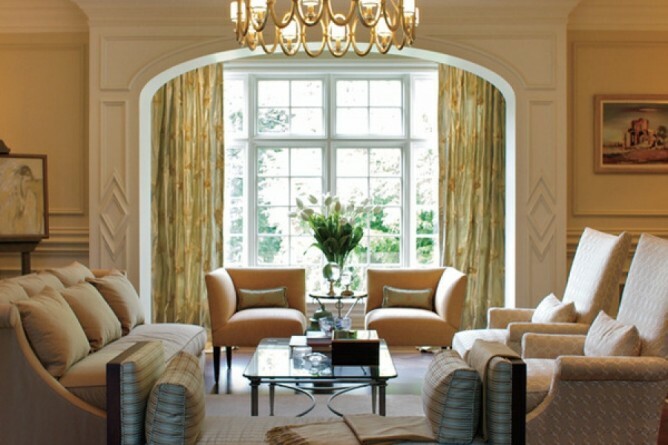 The challenge in this large open space was not to have too many focal points in a room. “The view is already a focal point,” says the designer. That is not to say the home is without visual treats of its own, such as the fireplace, clad in steel and surrounded by millwork. “The steel and wood are a nice juxtaposition. You see it right when you walk in the door,” she says. Across from it is a relief sculpture commissioned from Peter Gallo. Canno created a floating wall for it that doubles as a partition between the living and dining rooms. Two steel columns on either end suspend the wall and frame the artwork. In the master bedroom, she designed a stained white-oak bed with a leather headboard that conforms with the light palette throughout the home. And Joanne Hudson worked with the couple on a custom kitchen. “We picked out everything from the appliances to the stainless-steel countertops,” says Neducsin. Outdoor spaces include two decks, one of which spans 45 feet, and these areas are enjoyed as much as possible by the couple. Now in their home a year, Neducsin says they use every inch of the house. “Our old house was three stories, and we didn’t use all of the rooms. Here we use every one.” Especially those in which they can enjoy the views, facing west and south. “You can see the park and all the way to the stadiums. Everything I loved about Avalon is here, but in the city.” Sales center located at 1708 Rittenhouse Square St., 215-731-1706.